This lovely tear and share bread looks great as well as tasting fab and goes with home-made soup very nicely. The original recipe was found in Sage and onion tear and share bread on BBC Food, and I adjusted it a bit for this post. I thought heating milk is a rather fiddly job, so I warmed the water in the kettle and poured the warm water over the cold milk. This made the milk and water mixture nice and warm. Just be careful not to boil the water as this will make the liquid mixture too hat. The dough is really wet and sticky. If you have a mixer, let the machine to do the kneading. Well..., I don't. So I got on with the job by hand. You could decrease the amount of milk from 150ml to 100ml and see how it goes. Warm up 150ml/5fl oz water and pour over cold milk (This makes quite a wet dough. So, it could change to 100ml milk + 150ml water). Sift the flour into a large mixing bowl and stir in the yeast, sugar and salt. Make a well in the centre and stir in the water and milk with a large wooden spoon. Gather into a ball then turn out onto a lightly floured surface and knead for 10 minutes. Place the dough in an oiled bowl and cover loosely with oiled clingfilm. Leave to rise in a warm place for 45-60 minutes or until doubled in size. Meanwhile, melt the butter and oil in a large non-stick frying pan and fry the onion and garlic over a very low heat for 10 minutes, or until softened. Scatter the chopped rosemary (or sage) over the onions and cook for a further 2-3 minutes. Remove from the heat, season with lots of freshly ground black pepper and set aside to cool. When the dough has doubled in size, tip it back onto a floured surface and flatten with the palms of your hands. Spoon the onion mixture on top and knead for a couple of minutes until evenly incorporated. Sprinkle with a little extra flour if it becomes sticky. Divide the dough into eight and shape into neat balls by pulling the dough from the outside of the ball and pushing into the centre. Turn over with the ends underneath. Place the rolls in a circle on a large baking tray lined with greaseproof paper, making sure the dough balls are touching. Cover loosely with oiled cling film and leave to prove in a warm place for 45 minutes, or until doubled in size. Brush the top of each roll lightly with milk and place some rosemary leaves (or a small sage leaf) on top. Brush with more milk and bake in the centre of the oven for 20 minutes, and decrease the temperature to 160c and bake for a further 20-15 minutes or until risen and golden-brown. Transfer to a wire rack and leave to cool a little before serving. Here are my very chocolatey vegan chocolate cupcakes with walnuts. You can make them without walnuts if you prefer a smooth texture. This cake mixture also works for a round cake tin for a birthday cake base. You will need a longer baking time of 40-45 minutes for one big round cake. I made the round cake version with orange flavour by adding zest of one orange to the cake mixture. I also spread a good orange marmalade in in the middle when the cake become cool enough to slice. Sieve together the flour, sugar, cocoa, bicarbonate of soda and salt. Add the oil, vanilla, lemon juice and water. Mix together until smooth. Add walnuts. Pour into prepared muffin tin and bake at 180 C for 20-25 minutes. Decorate with cocoa icing (cocoa + icing sugar +water) and crushed walnuts. I really enjoyed the Sicilian oranges from my lovely Italian friend. Here are the cupcakes which have orange zest in the cake mixture. I only used the zest of orange but the lovely orange flavour was certainly there in the cake. I used crème fraîche instead of milk for the cake mixture to compliment the fresh flavour of orange. They are really moist and have a light texture. I'm not a "pretty cupcake" maker really but I just felt like making something a little fancier than my usual products. So I decorated them with my take on "buttercream icing". I used crème fraîche. The common ratio between icing sugar and butter is 2:1. You also need milk to loosen the consistency of the frosting. I replaced 25% of butter with crème fraîche, which I think provides a good balance for piping the frosting. You can replace butter with margarine if you really want to go for the low-fat option like I did. Pre-heat the oven 160-180 °c. Put all ingredients in the food processer and mix well. (all-in-one method) To make a dropping consistency, you may need to add more crème fraîche. When the cupcakes are baked, let them stand for 5 minutes, then turn out to cool. Decorate with lemon juice + icing sugar mixture or pour a drop of crème fraîche on top to make the cupcakes into a dessert. If you prefer, you can make crème fraîche frosting to decorate them. Boil the water and pour over dried fruit and a Earl Gray tea bag. Soak the dried fruit in the hot tea for 2 hours. Mix the carrot, orange zest, dried fruit with tea and oil. Then sift together the flour, baking powder and mixed spice into the bowl. Stir all this together, then pour the mixture into the prepared muffin tin and bake in the oven for 30-35 minutes. When the cupcakes are completely cold decorate with creme fraiche and icing sugar topping and sprinkle with cinnamon. Here are my humble carrot cupcakes with a little bit of flair. My recipe was inspired by Delia's Low-fat Moist Carrot Cake. I adjusted her recipe for cupcakes and used half-fat crème fraiche, so they are even more low-fat. Juicy fruit and crunchy walnuts give these cupcakes a lovely flavour and texture. As you expect, grated carrot keeps the cupcakes very moist. Begin by whisking the sugar, eggs and oil together in a bowl using an electric hand whisk for 2-3 minutes. Then sift together the flour, baking powder and the mixed spice into the bowl. Stir all this together, then fold in the orange zest, carrots, dried mix fruit and chopped walnuts. Pour the mixture into the prepared muffin tin and bake on the centre shelf of the oven for 25-30 minutes, until they are well risen and feels firm and springy to the touch when lightly pressed in the centre. While the cupcakes are cooking, make the topping by mixing all the ingredients in a bowl until light and fluffy, then cover with clingfilm and chill for 1-2 hours or until needed. When the cupcakes are completely cold, remove them from the tin, spread the topping over and dust with a little more cinnamon. Juicy, sweet and full of flavour. Sicilian oranges are the best. My beautiful Italian friend Giacoma brought lovely oranges from Sicily. :) So I baked this cake to enjoy the taste of sunshine. My recipe was inspired by Rick Stein's recipe. It's a simpler and smaller version of his with a little adjustment. Very moist and full of flavour. Preheat the oven to 170C/gas mark 3. 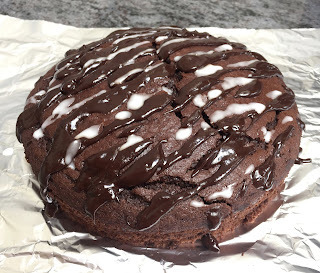 Grease and line a 20cm clip-sided round cake tin with non-stick baking paper. Beat in the eggs, one at a time, beating well between each one, if necessary adding a spoonful of flour with the last egg to prevent the mixture from curdling. Spoon the mixture into the tin and bake on the middle shelf of the oven for 40-55 minutes or until a skewer, inserted into the centre of the cake, comes out clean. If it starts to brown too quickly, cover loosely with a sheet of lightly buttered foil. This is a very easy fruit cake. Just remember to soak the dried fruit with liquid overnight. I used lemon juice and water, but apple juice is a very nice alternative. The cake is very moist as you would expect. I made fruit cake in a hurry without soaking the other day and the cake turned out really dry. So, using "juicy" dried fruit is definitely the key. Soak the dried fruit and lemon zest with lemon juice and water overnight. Put low-fat spread (or butter), sugar, flour and eggs in a food processer and mix well. I often use an electric hand mixer. Gently fold the soaked dried fruit and the juice into the mixture. Bake it in the oven for about 50 minutes until a skewer comes out clean from the cake. When the cake is baked, let it stand for 5 minutes, then turn it out onto a plate.